A Sitka man has been turned over to US Marshals, after he was indicted in federal court in February. In an unrelated incident, his trailer park home burned to the ground on Monday (3-25-19). 44-year old Jeremy Beebe was arrested by Sitka police on March 5, and handed over to federal authorities, on charges that he illegally possessed weapons as a felon. Sitka police last October obtained a warrant to search Beebe’s residence, and allegedly found multiple firearms, explosives, and narcotics. Beebe had several prior convictions. In 2016 he literally went “underground” to elude capture when he failed to report to jail to serve a 21-month sentence. Police officers at the time discovered a room had been dug under Beebe’s home in the Vitskari Trailer Court, connected to an elaborate tunnel system. Officers searched the immediate vicinity for a possible exit, found it, and also found Beebe, who faced additional charges of contempt of court for the incident. Beebe is currently being held in the Lemon Creek Correctional Center in Juneau. In an unrelated event, Beebe’s Vitskari trailer was completely destroyed in a fire late Monday night (3-25-19). Sitka fire chief Dave Miller says the call came in around 8 pm, that 216 Vitskari Drive, Number 6, was fully involved in a fire. The occupants of the trailer all made it out safely. 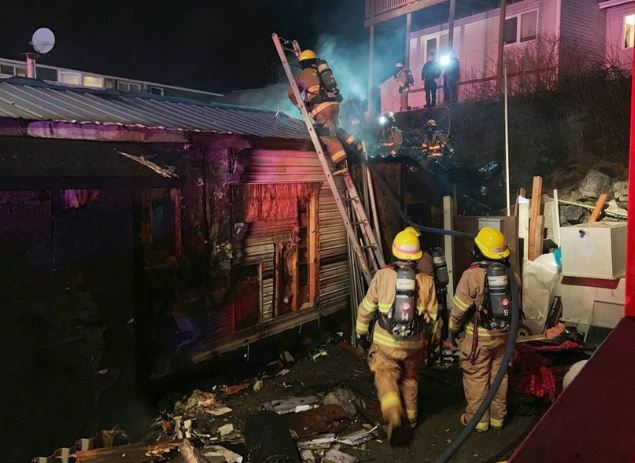 The fire department responded with 2 engines and about 20 firefighters, who took the better part of 5 hours to douse the flames, which Miller believes started in the trailer’s electrical wiring. Fighting the fire was complicated by the number of propane tanks, gasoline, and black powder in the building — some of it locked in Beebe’s underground cache. Miller says the trailer is a total loss, and no further investigation is pending. In addition to 20 firefighters, 10 EMT’s, and 2 police officers responded to the call. The incident was concluded by 1 a.m.